Last March in a presentation at World Hosting Days, AMD quietly announced that it would be bringing its Jaguar architecture to servers. Today we’re seeing the fruition of that announcement as AMD launches its Jaguar-powered “Kyoto” chip, which will be branded as the AMD Opteron X-Series. Jaguar is AMD’s low-power x86 core and it’s already being used in a variety of new systems including Sony’s Playstation 4 and Microsoft’s Xbox One. 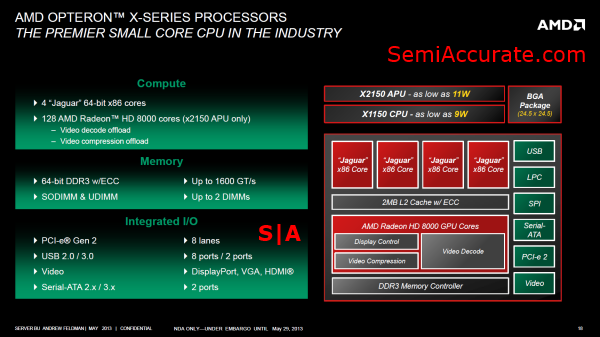 It should come as no surprise then that AMD sees a variety of opportunities for it’s low-power APU. Many observers were disappointed when AMD chose not to bring its prior low-power core “Bobcat” into the server market. AMD arguably made the right decision at the time to avoid undercutting it’s own high-end server sales, but now that AMD’s server share has dwindled considerably over the past two years the company is looking to go on the offensive by launching its low-power core into the server market. Some might see AMD’s “Kyoto” as a reaction to Intel’s Atom-based “Centerton” chip which launched in Q4 of last year and was branded as the Atom S1200 series. But AMD’s quad-core X-Series chips should prove to be notably faster than the dual core design Intel is selling, while consuming about the same amount of power. At the present time the micro-server market that AMD and Intel are now being to battle over is still in its infancy, but it’s projected to grow rather quickly over the next five years. We were lucky enough to get a chance to chat with AMD’s VP of Servers, Andrew Feldman about Kyoto and the Opteron X-Series. In his mind the value proposition that AMD is making with these new processors comes down to leadership in the two metrics that matter in the micro-server market; Performance per watt per dollar and compute density per dollar. According to Mr. Feldman, “Intel has been holding the [micro-server] market back. ” and AMD’s Opteron X-Series of chips are, “Orders of magnitude better” than the dual-core Atom S1200 chips that Intel is offering now. 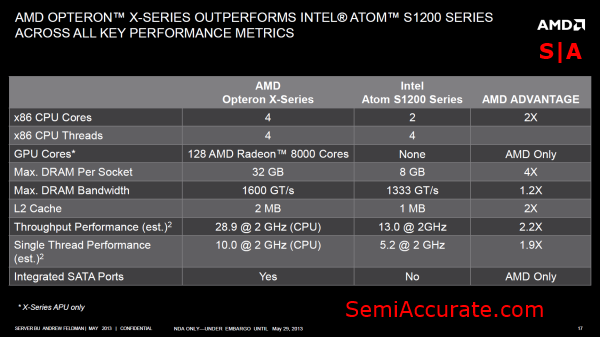 AMD’s specifications for the Opteron X-Series seem to support Mr. Feldman’s claims as well. Higher memory bandwidth, a larger memory footprint, more cache, more cores, and higher performance cores all add up to a significant raw performance advantage for AMD’s X-Series. This maybe why Mr. Feldman was willing to declare that, “Kyoto is so far ahead in so many dimensions.” compared to Intel’s S1200 series. AMD also has an advantage over Intel in its pricing structure. The Atom S1200 series is priced between $54 and $64 a unit, which means that AMD is matching the price of the top SKU with its X1150 model and exceeding it with the X2150. Considering that AMD’s Kyoto processor is a small chip built on a well-known 28nm process, it looks like AMD’s micro-server business should prove to be a relatively high-margin segment. Even more important though it looks like we finally have a market segment in which AMD can dictate the pricing structure rather than just undercutting Intel. But by far the biggest advantage that AMD’s Opteron X-Series has over Intel’s Atom S1200 chips and it’s higher-end Xeon offerings, is its System-on-Chip design. Intel’s servers all require a two chip solution for a 1P server, but AMD’s “Kyoto” is a single chip design. This means that using AMD’s X-Series will prove to be a less expensive proposition for server OEMs and customers who won’t have to pony up for the costs associated with having support chips in addition to the APU itself. It also means that these same OEMs can pack servers based on AMD’s X-Series into denser configurations than Intel-based solutions. The only possible draw back to AMD’s Opteron X-Series is power consumption, which should be equal to or higher than the Atom chips they’re going up against. It’s hard to pin down exactly how exactly these chips will line-up in this regard. But AMD is quoting 9 Watt and 11 Watt numbers while Intel’s chips come in at between 6 and 8.5 Watts. It’s important to remember though that AMD’s chips are a complete SoC, while Intel’s solutions still require support chips that will undoubtedly add to the total power consumption of Intel’s micro-server platform. 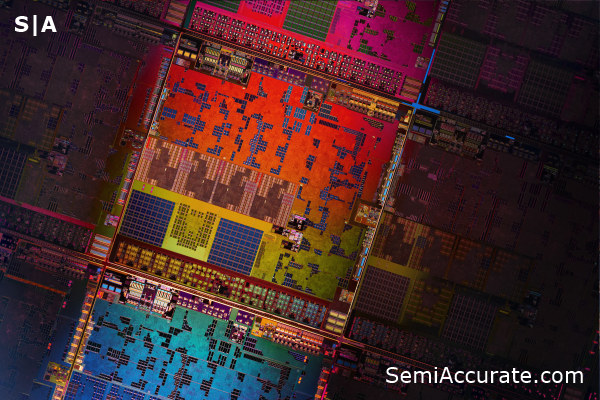 But no matter where the power consumption numbers fall, it’s hard to imagine a scenario in which AMD’s X-Series chips consume enough power to negate their raw performance advantage over Intel’s S1200 series from a performance per watt perspective. Especially considering that OEMs will have the final word on exactly how much power AMD’s X-Series chips draw thanks to configurable TDPs. Kyoto incorporates many of the features that make Temash and Kabini such good fits for the cost-sensitive consumer market and then adds a few features that are tailored to the server market like ECC memory. AMD has also chosen to offer a more robust memory controller with Kyoto that supports up to DDR3 1600 as opposed to the maximum memory speed of DDR3 1333 on AMD’s other Jaguar-based chips. This brings us to one of the more interesting features of AMD’s Opteron X-Series lineup. There will be two chips, one with its GPU core enabled and the other without. Despite the lack of GPU cores, all of AMD’s fixed-function hardware blocks that we normally associate with GPUs will still be available on the X1150. The biggest difference between these two chips is really their TDP’s which start at 11 Watts for the GPU enabled X2150 model and 9 Watts for the GPU-less X1150 version. When questioned as to why AMD was bothering to offer a GPU enabled X-Series part at all Mr. Feldman was quick to describe a market in which the 128 GCN cores on the chip could be put to use analyzing various types of large data elements like images and video. By his own account there is a niche market for a low-power server chip with a big chunk of GPU hardware, and apparently the market is sizable enough to justify AMD’s attention. 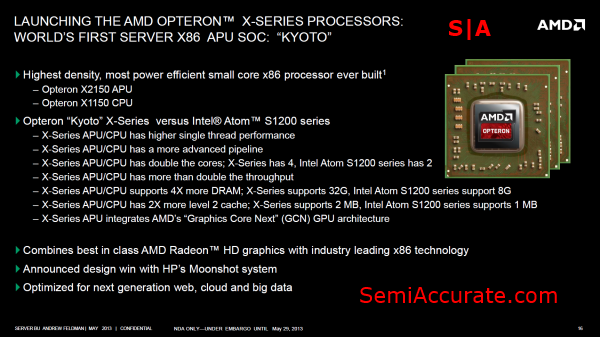 What AMD is offerings with the Opteron X-Series is summed up in this slide. But there is one major item in here that we haven’t discussed already, HP’s Moonshot. Initially Moonshot was an ARM only micro-server platform by HP, but recently HP and Intel introduced a version based on Intel’s Atom S1200 series chips. At the time AMD didn’t have anything to counter with, but now that the X-Series has arrived HP’s will be one of the first and most important micro-server vendors to offer AMD’s chips. Mr. Feldman, who is also the ex-CEO of SeaMicro, was very forthright in describing the Opteron X-Series as the best micro-server chip on the market. Although he was a little more coy when it came to the possibility of revamped competition from Intel’s recently announced low-power Silvermont CPU core. Choosing to argue that server products based off of Intel’s Silvermont are still just names on a roadmap, while AMD’s Opteron X-Series chips are here today and are outperforming Intel’s offerings. Speaking to AMD’s broader effort to compete with Intel, Mr. Feldman pointed out that Intel is now behind AMD in the micro-server market. But he also expects that Intel will try to leverage its leading-edge process technology advantage to become more competitive. This brings us to where Mr. Feldman believes we’ll see the Achilles heel of Intel’s business model, which is the massive capital expenditures required to build leading-edge manufacturing facilities. The advantages of moving to small geometry processes are declining and the cost of developing and producing chips on a leading-edge process continue to multiply. In his own words, “A process advantage won’t help Intel eventually.” Basically he expects the law of diminishing returns to turn the market into a more even playing field at some point.